On numerous occasions, we have pointed out that the people shouting about global warming do not conform their actions to their words. It isn't just Al Gore or Leonardo Di Caprio running around the world in private jets (the least carbon-efficient form of transportation) to make "we need to cut our carbon footprints" speeches. 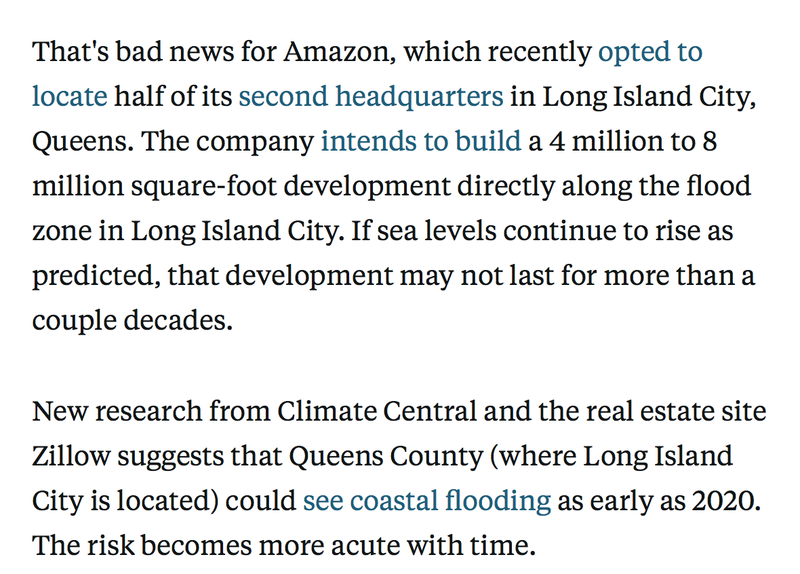 It isn't just the Maldives demanding money because it is being flooded by rising sea levels ("our nation is sinking") when in fact no flooding is occurring and the islands are enjoying a beachfront building boom. 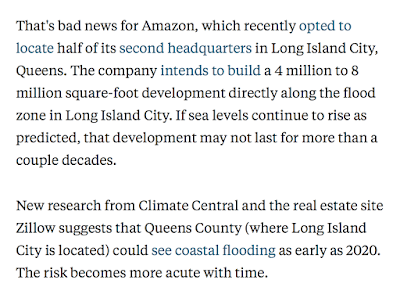 But, if he genuinely believes the threat is so imminent and dangerous that it needs another $1 billion thrown at it, it is curious that he is building his new headquarters in an area that, according to Climate Central, is going to begin flooding in just two years. Of course, Mr. Bezos and Amazon can choose to spend their money however they wish. But, it is curious that global warming is so serious that it is worth spending another billion dollars on yet they are building in an area what will begin global warming-related flooding in just two years. At first glance, it appears it is another case of global warming words not matching global warming actions.